Taking the place of an outdated Stop & Shop here in Nyack, NY is the all-new, independently-owned Met Fresh Market. It's 28,000 square feet, a former Grand Union. Stop & Shop closed this store in favor of the newly-opened Orangeburg, NY store, much nicer, and it sat vacant for a few years before being leased by independent supermarket operator Rudy Nuñez, who also owns stores in New York City. Like so many of the stores we've been seeing recently, it was completely gutted before being reopened. Not sure if this store still has its Grand Opening signage; at the time of my visit in February it did. (The Elizabeth Food Bazaar still has a Grand Opening banner a year after they opened!) Interesting that this store chooses to have nonfood merchandise outdoors like firewood and rock salt - most stores like this put nonperishable foods outside. Notice the garage door-type cover here. At night, they can simply pull it down and lock up the merchandise. Heading in, you enter and immediately turn to the right to enter a spacious produce department. The front wall of the store is to the right here; the right-side wall is straight ahead. Looking from produce towards checkout and beyond, deli/bakery. All the fixtures, as well as the flooring, are new. Very large organic selection and lots more organic vegetables are on a separate shelf. However, pricing was a little steep for me. Looking toward the back of the store along the first aisle. Notice how the produce department continues in the first aisle. Looking towards the front wall of the store from the first aisle. Bulk nuts, grains, and beans are in produce cases here. My one suggestion for them in the grand aisle would be to use lower produce cases so that you can see more of the department at any given time; these cases are quite tall. Another picture looking towards the back of the store from produce. Produce continues about 1/2 of the way along the far-right wall of the store before switching to cold beer cases. Meat is along the back wall. Strange placement of cheeses and cold cuts ... this is on the complete opposite side of the store from the deli! This is at the back of the first aisle. Nice bulk coffee bar in the back corner of the first aisle - but why oh why did they use that font for GROUND COFFEE, or at least make it Ground Coffee! That font just doesn't work in all-caps. Looking along the back of the store. The seafood counter is in the farthest point from the entrance; in the far back corner on the left-side wall. 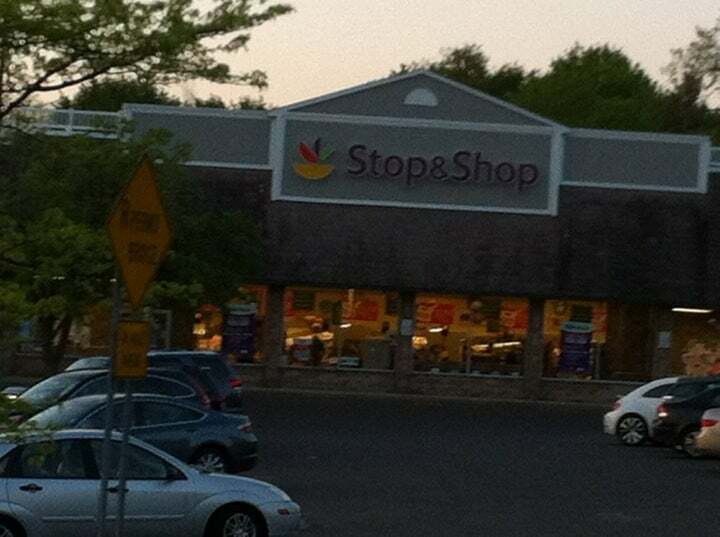 Stop & Shop did not have a fresh seafood counter or a hot food counter and had the same decor as the location in Westfield. The yellow price labels might be a little overkill, and it might not have been a bad idea to bring those cardboard boxes back into the backroom...but otherwise a nice aisle shot (looking towards the front wall). Nice selection of Bob's Red Mill products, but once again, pretty high prices. The same aisle, looking towards the back wall. There we go, that's a cleaner aisle! Seafood in the back corner. Unfortunately that's where the tour ends...I noticed at this point a manager eyeing me suspiciously and since I'd rather not get kicked out of another store, I gave up. But you get the idea! Now this is the store layout I'm used to, especially in regards to produce being directly to the right upon entering! The aisle signs look pretty weird, though - almost homemade, even. And glad you were able to avoid a confrontation! Funny, because to me this layout is pretty strange. The newest stores around me tend to have a "grand aisle" or "power alley", as they sometimes call it, with produce in the center and along the first aisle and bakery, prepared foods, deli, seafood, and meat (often in that order, from front to back) along the outside perimeter wall. Packaged meat tends to be along the back wall; dairy in the last aisle; frozen foods in the second-to-last aisle; pharmacy (if there is one) in the front corner opposite the entrance. 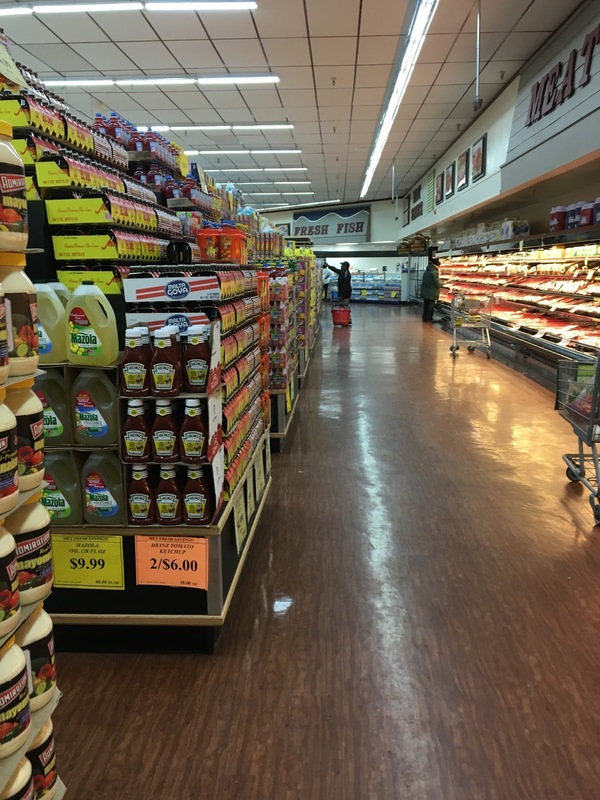 That's the layout of my local supermarkets, and one that Village Super Markets (shoprite.com/member_sumas), which owns my local ShopRites, has been using since at least the 1970s. CitiGrocer in Elizabeth (https://www.flickr.com/photos/142408586@N05/albums/72157668103730285) is closer in layout to this Met Fresh, while the Livingston ShopRite represents the average new supermarket around me (https://www.flickr.com/photos/142408586@N05/albums/72157674688673796). For such a nice store, the aisle markers are strangely amateurish. In fact, when I first saw pictures of this store when it initially opened, I wondered if they were left over from Grand Union, but they weren't. They were almost certainly left over from another store because the Met Fresh logo is clearly a decal, not built into the sign. Looking at things a little closer, I think maybe I should've just stuck with the "produce inside the entrance" comparison instead of referring to the entire layout :P Grand aisles are what's typically found around me these days as well. You enter and hang a right (or a left, if the store is reversed) into produce, with the ensuing perimeter side wall holding the deli and bakery, and then the back right (or left) corner of the store housing meat and seafood. The back wall likewise has packaged meat; however, it's also home to dairy as you further make a circuit around the store, and frozen is actually along the other side wall rather than contained within the aisles. Of course, that's probably attributable to the fact that grocery stores seem to be larger out this way as compared to up where you are. And the pharmacy is indeed in the front left corner (or right, if reversed). I'm not quite sure why this store's layout made such an impression on me, haha! I guess maybe because it just seemed a bit more traditional in the way it looks, even though my stores really aren't that different in layout from your stores after all. I would definitely have sprung for new aisle signs then, if these were in fact left over. I just assumed Met Fresh installed them themselves. Hopefully they'll find the budget to replace these with more professional-looking ones soon! OK, I guess the layout you're describing can be found around here too. Like everything else in this part of the country, our supermarkets are generally older and more frequently retrofits into spaces that used to be something else or just old supermarkets - and the buildings themselves are older. The Livingston ShopRite I referred to above was built in 1955, for instance, but is now one of the most modern around. I remember reading somewhere (can't remember where right now...sorry if this was something YOU told me or something I've already told you!) that most new stores are set up to direct the shopper in a counterclockwise direction around the store because most shoppers are right-handed, making taking items out of the cases on the perimeter easier. I can't for the life of me figure out where Met Fresh may have gotten those signs. If they made them new for this store, they should fire their designer. If not, I've never seen anything like them, so I really have no idea. It could be one of Rudy Nuñez's other stores that happened to have them hanging around and they matched that decor better. Maybe someone else can fill us in there! I've always found that nice about the older parts of the country: the reuses and renovations. The relatively newer-established parts (my area included, but not referred to exclusively) seem to have so much space that retailers (and others) who want to abandon their existing buildings for newly-built ones on nearby property have the freedom to do so, leaving the old stores to rot in the event that they're not able to be retenanted. I much prefer revitalization of what's extant!